First of all, we plan to raise the funds to get the show produced. Ideally we’d like to find a sponsor that would take on the whole show, however; we are working to get 3 segments of the pilot produced via individual sponsors. Those segments would be valuable assets for the sponsors and at the same time, we would edit the show “sizzle reel” in order to procure funding for the rest of the segments. 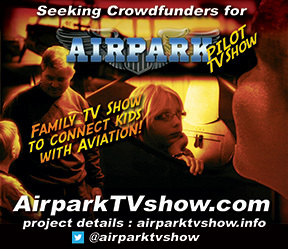 The pilot and the subsequent episodes of Airpark TV will be produced at many different locations. The production will be filming re-enactments in real film, setting up reality TV segments of real life kids in their aviation workshops, and other features. We will be coordinating production with existing youth outreach groups in order to produce the reality segments, and promote those youth outreach programs. We will seek out the old timers and today’s heroes from the local airparks and get those great stories to the screen. The shows are being developed so that each segment complements the other. All parts fitting together nicely for a fun, entertaining and engaging experience. As many in Hollywood will tell you, film is far superior to the digital cinematography and better suited for storytelling. Film student’s these days have never exposed one frame of real film, or experience the level of precision required to work in film. 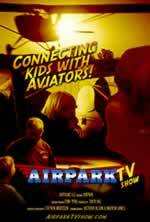 We will be filming Airpark TV re-enactments in real Super 16mm film. The program will have a much better feel to it and we can help train a few in the film discipline needed to be able to deliver the cut above production levels we do with film. Each of the feature or segments within the show will be produced by individual producer directors, and each episode overseen by an executive producer and editor who will bring each episode to life. Preliminary estimates are that, properly prepped, each episode could be shot out within two weeks. The production will need to have the appropriate insurance to be able to work in and around aircraft and bring that spectacular footage to the screen, including air-to-air, and having cameras attached to aircraft to bring home spectacular footage. Post production, the editing will likely take about 20 days per episode. Post production will all be done using Final Cut Pro X, going to the former track based systems only for tape delivery. Once the pilot is completed, we will be seeking to get the operation funded to go into production individual segments or hopefully a full 13 week package that would then be offered for distribution on cable, pay per view and have a digital download component. Distribution channels will be determined as the project evolves since distribution rights will be determined during negotiations. Check back for an updated post on a brief overview of the intended distribution plan! It is very important to us that we retain control over the content, the stories and how the show is produced. No one would be very happy if Airpark went the way of many where the network takes over all control and diminishes the true essence of this show. For that reason, we will be seeking digital delivery and distribution.